Amica House is located in Tavan and Laochai villages in the middle of Muong Hoa Valley, surrounded by Hmong Villages and natural landscapes . 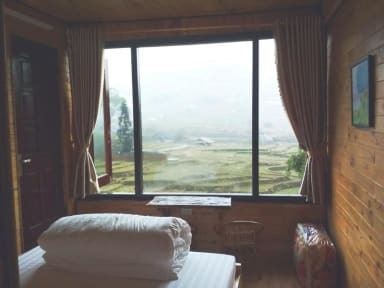 There are 3 double rooms for rent , with nice view to the valley, river, villages , rice fileds and mountains. All the rooms have private bathroom and toilet, with charming decoration . 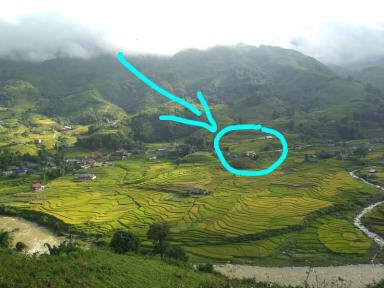 The Amica House is isolated , far away from the noise, then it's can be a pecfect location to start your trek to many villages in the area as Laochai, Tavan, Giang ta Chai, Seo Mi Ty. You can also rent a bike from the Amica House to go further until Banho or Thanh Phu Village. Many options to spend about 2-3 days when you stay in Amica House. Une petite famille accueillante et adorable, dont le père parle français. Des chambres fraîches mais de grosses couvertures moelleuses. Une petite maison au charme fou et surtout une vue exceptionnelle sur la vallée ! Et ca, au réveil c'est juste extraordinaire ! Je recommande mille fois.